You may think Sphynxes look a little like the Crypt Keeper, but they are usually healthy and lovable—and mostly hairless—cats. They're not entirely naked though: usually these feline nudists sport fine, peach fuzz-like down all over. In fact, they often have short hair in select spots, like their ears and noses, as well as their tails and sometimes toes. Ironically, this is Canada's only contribution to the cat-breeding world——evolution is weird sometimes, huh? WHAT IS THE SPHYNX'S PERSONALITY LIKE? Sphynxes are silly, sometimes almost clownish, in their endless endeavors to catch and keep your attention. This breed is full of affection and mischief. Humans are their favorite sort of company, but Sphynxes can also get along well with dogs and other cats. If you're not home very often, consider getting your Sphynx a furry friend to keep her company. Don't worry—this cat thinks far too highly of herself to fuss over not having a fur coat like the New Cat. WHAT IS SPHYNX BEHAVIOR LIKE? This cat might be part monkey. Well, not literally, but if you've ever seen a Sphynx swing her way to the top of a door frame, this genetic impossibility might seem more than likely. They also wag their tails like dogs and demand your attention at every possible minute. HOW CAN I KEEP MY SPHYNX ENTERTAINED? Sphynxes live for the applause. Yours will follow you around everywhere—let her keep you company or entertain you with her antics, and she'll be more than entertained. Just be careful of breakables, as these kitties are known to go to extremes for that attention. 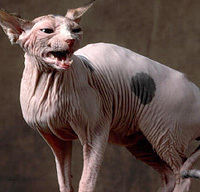 WHAT DO SPHYNXES LOOK LIKE AND WHAT ARE THEIR GROOMING NEEDS? Sphynxes are hard to miss—there just aren't that many hairless cats wandering around. Or hairless-looking, anyway. This breed is actually covered with a fine, nearly invisible downy fuzz. Show Sphynxes should be wrinkly. Yours will require regular baths and ear cleanings to remove oily secretions and prevent skin problems. WHAT HEALTH PROBLEMS DO SPHYNXES HAVE? As a breed, Sphynxes are generally healthy. Some are susceptible to heart disease and neurologic conditions. These cats can also develop skin conditions or gum disease. As you might guess, Sphynxes are also particularly sensitive to the cold. (Bonus: Matching adorable sweaters!) A good guide rule is that, if you're chilly, so is your Sphynx. However, they're pretty good at finding their way under your covers or atop your lap to stay warm. ARE SPHYNXES GOOD FOR PEOPLE WITH ALLERGIES? Sphynxes are among the breeds generally recommended for allergy sufferers, probably because they don't shed much. But shedding less doesn't make these breeds hypoallergenic. Dander found in urine, dead skin, and saliva (not pet hair) is what sets off allergy sufferers. Lighter-shedding cats will distribute fewer allergens around your home, though. WHAT IS MY SPHYNX'S BEST DAY? You can rest assured it involves being Up in Your Business as much as felinely possible. Let her tickle your fancy by performing tricks she's learned, and follow you around the house as you go about your day. If you really want to rock her world, set up a climbing environment for this monkey-cat and give her the chance to explore your home's stratosphere. SHOULD I ADOPT A SPHYNX? Sphynxes are opinionated, active, affectionate cats. If you're looking for a snuggly, lovable feline companion who will also absolutely never need a haircut, this is the breed for you. Have you decided that a Sphynx is the purr-fect cat for you? Why not be your new best friend's hero and adopt a rescue! Be sure to check out our article on what to expect when you're adopting a dog or cat.